Canes are used as a crutch or mobility aid. They can help redistribute weight and improve stability. They also come in a variety of different sizes and models. Single tip canes are available as well as quad canes. 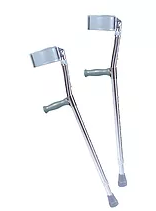 Crutches are a mobility aid that transfers weight from the legs to the upper body for those who cannot use their legs to support themselves. Forearm crutches are similar to regular crutches however you support yourself on your forearms rather than underneath your armpit. A knee scooter is a four wheeled alternative to crutches or a traditional walker. The patient is to place their injured or weak leg on the seat and kick off with their dominant leg. 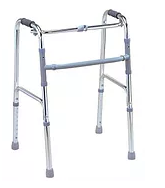 A rollator walker is a tool used for additional support and stability while walking. They come with a seat and hand brakes for safety as well. Walkers can be used as a daily walking aid and can reduce the stress on painful joints or limbs, or simply help balance.